Ribbon cutting for bike parking in San Diego, Calif.
We cannot create a Bicycle Friendly America℠ on our own. 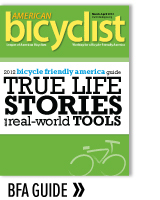 Every time you ride a bike you are helping our Bicycle Friendly America program. 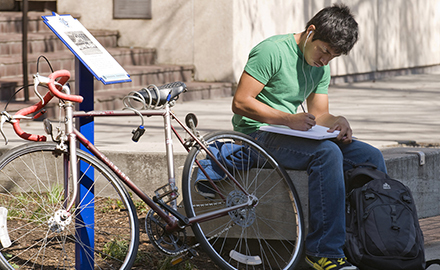 We want to make sure you have the best resources to transform your community, workplace, campus and state into one which can be recognized by us as bicycle-friendly. 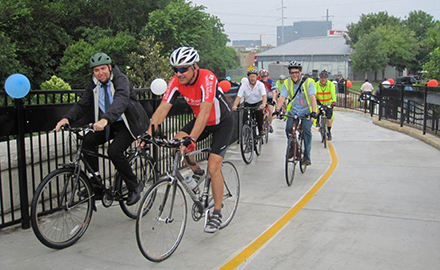 Receiving such nationwide recognition by the League demonstrates measurable success in achieving goals of the program, and also helps us provide public awareness of bicycling issues. 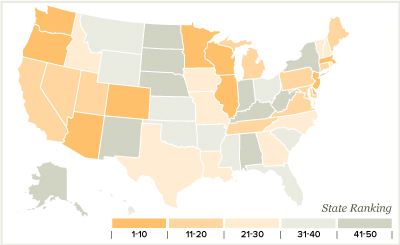 Here are some tools to help your local and state efforts through the BFA℠ program. If you have questions on how to use any of the below-mentioned tools, please give us a call 202-822-1333. The BFC, BFB, BFU, and BFS programs are described in one booklet. The digital BFA Booklet is designed to give advocates, elected officials, business leaders, students, and university administrators a comprehensive look at the BFA programs. A visual and written tour of the four programs, the small booklet also includes a brief self-assessment tool to evaluate the bicycle-friendliness of your community, business, or university. The booklet is available for download and print. Print your desired quantities and place a local organization sticker on the back of the booklet. Promoting the BFA programs on your website is a terrific way of highlighting the success stories in your area (i.e. awarded businesses, communities, and universities). Using your website as a connector for all your local or regional BFA awardees makes for a more robust bicycle-friendly network. Hosting a BFA presentation is a cost effective and efficient way of distributing information about any of the four programs. This could be done onsite or through a webinar by a local advocate, League staff, or both. Organization of a BFA presentation is easy and is a great way to bring together various local partners and build momentum. Download an overview of the BFA program or a presentation specific to BFB, BFC, or BFU below or request a copy in PowerPoint format, email bfa@bikeleague.org. The presentations are each about 10-15 minutes in length with the script and can be presented at your convenience. Organize a webinar for your region with a League representative by contacting bfa@bikeleague.org. 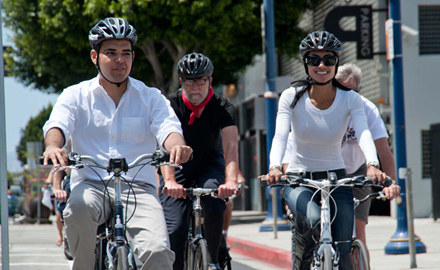 BFA Guide - This Guide looks at actions by leading Bicycle Friendly Communities, Businesses and Universities in 2012-13. Use it for inspiration and guidance as your community, business, or university takes action to make biking better. BFA Blueprint - This blueprint looks specifically at the Bicycle Friendly Community program and describes actions that communities have taken across the 5 Es. Bicycle Account Guidelines - This guideline document is meant to help communities, businesses, and universities learn about evaluation tools that they can adapt to their organization to measure bicycle-related improvements, including public surveys. The New Movement: Bike Equity Today - This report looks at efforts through the United States to make bicycle advocacy and related groups reflect the diverse population of people who bike and address the specific needs of diverse populations through programming and outreach. 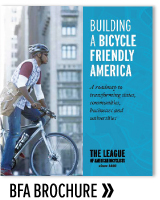 BFA Brochure - The BFA Brochure provides a high-level overview of the Bicycle Friendly America programs and the impact they have had. It is an ideal primer for the community, business, or university considering participating in a Bicycle Friendly America program. Each Bicycle Friendly America program is built around five categories — known as the Five E’s — that are consistent in making great places for bicycling. These categories are Engineering, Education, Encouragement, Enforcement, and Evaluation & Planning. View more here. Find resources for each BFA program by going to that program's FAQ page or find all of our BFA resources here.